Reports on, modifies, and deactivates BricsCAD single-user or volume-license keys. Review license information, and then click OK.
Click Yes, and BricsCAD can no longer be used on this computer, but is available for activation on another computer. Enter a name or IP address in the Host Name field. Specify a number in the Port Number field. If necessary, turn on the Username option, and then enter a username and password. Displays the Activate BricsCAD dialog box; see the LicEnterKey command. Status - reports on the state of the drawing. LicEnterKey - changes the license number and owner. LicPropertiesBim - reports the BricsCAD BIM license information in a dialog box. 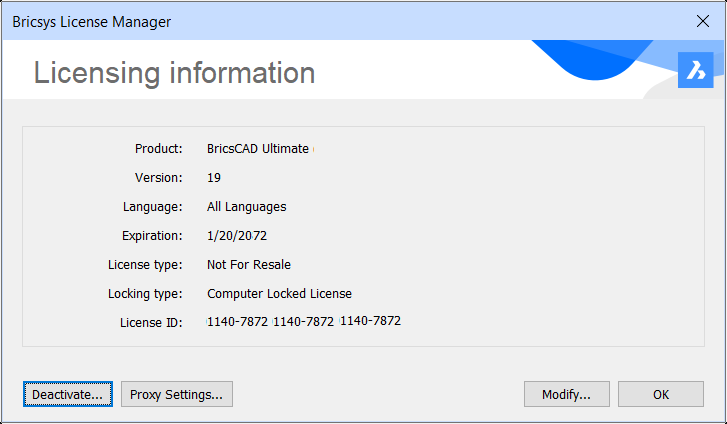 Allows to modify or deactivate a BricsCAD BIM single user or volume license key. LicPropertiesCommunicator - reports the BricsCAD Communicator license information in a dialog box. Allows to modify or deactivate a BricsCAD Communicator single user or volume license key. LicPropertiesSheetMetal - reports the BricsCAD Sheet Metal license information in a dialog box. Allows to modify or deactivate a BricsCAD Sheet Metal single user or volume license key.